Considering A New Gravel or Crushed Stone Driveway? Is A Gravel or Crushed Stone Driveway The Best Choice For Your Home? Which driveway surface is best when choosing between gravel, asphalt, interlocking pavers, or concrete? What are the benefits of a gravel driveway vs asphalt, concrete or permeable/interlocking pavers? 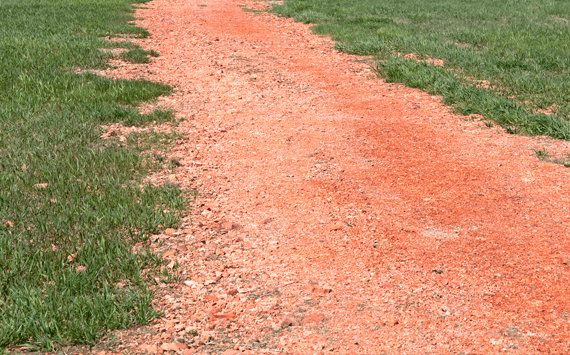 What type of ongoing maintenance does a gravel driveway require? What type material is best… crushed stone, gravel, pea gravel, crushed granite? What size of stone is best for a gravel driveway? 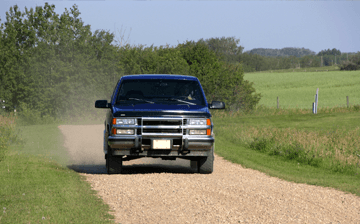 These are all very important things to consider when it comes to choosing a new gravel driveway. Gravel driveways and crushed stone driveways can be seen all over the United States! They’re affordable, relatively simple to maintain and you can create unique colors and designs with different types of gravel. In snowy regions they are much more difficult to maintain due to regular snow removal. If you’re planning on installing a gravel or crushed stone driveway and you live in a snowy region, plan on putting all of the gravel that was pushed off with the snow plow back onto your driveway every spring! Gravel driveways can be installed in the shortest amount of time with very little impact on the use of your driveway. Gravel driveway installation should be accompanied by meticulous drainage planning and an experienced grader operator to minimize the ongoing maintenance as much as possible. Depending on the size and scope of work involved, the construction of a new crushed stone or gravel driveway can be installed by an experienced grading contractor generally over a 1 to 3 day period. 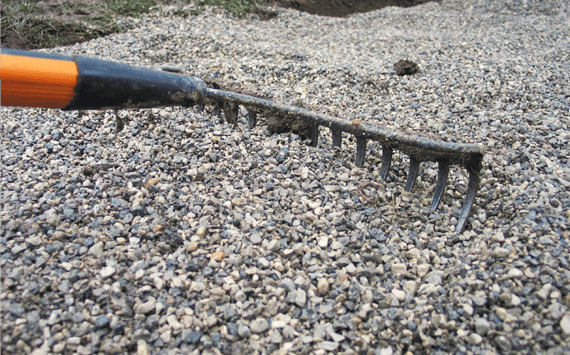 Crushed stone or gravel driveway installation is relatively simple. Most of the work is done with grading equipment and front end loaders so it can be completed fairly quickly with minimal impact on your daily routine. You can also expect to drive on and use the driveway throughout the construction of of a gravel driveway. 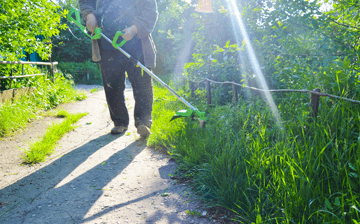 If you already own a gravel driveway and it’s beginning to show the signs of aging and deterioration, has a tremendous amount of weeds and has severe rutting issues, starting from scratch may be in order! This absolutely should be performed by a reputable gravel or grading company that will do it right the first time. If the existing gravel driveway shows signs of unstable sub-grade, the soil should be excavated and new base or structural material installed and then the new gravel driveway design installed on top of that for a solid, long lasting gravel driveway. when comparing cost and #1 when comparing ongoing maintenance. A gravel driveway is the least expensive driveway when comparing it to other driveway types. 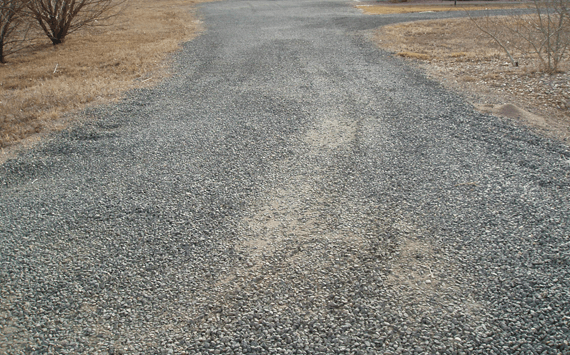 A gravel driveway requires the most amount of ongoing maintenance compared to other driveway types. A gravel driveway, if installed properly, can last up to 3 to 5 to even 10 years with regular upkeep and maintenance. The variation in age can be determined by the amount of slope on your driveway if any, the amount of curves in your driveway, the stability of the sub-grade, and the climate you live in. expect to perform on a gravel or crushed stone driveway? A properly installed gravel driveway will need an herbicide applied annually or bi annually to minimize vegetation growth. Fine tuning and sprucing up and/or additional stone may need to be added every two to three years to keep it looking clean cut! The amount of maintenance of a gravel driveway is directly correlated to the quality of the installation and the amount of slopes and curves you may have on your driveway, combined with the amount of moisture and water runoff you receive. 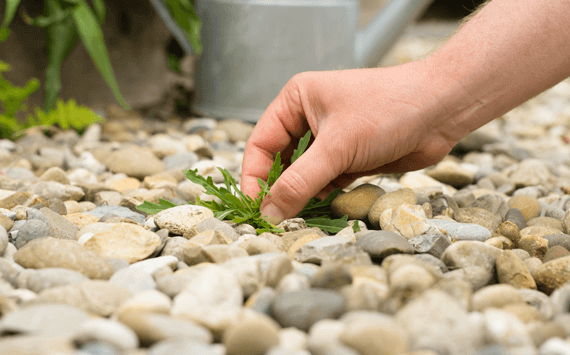 Applying a herbicide prior to the initial installation can help to minimize the amount of vegetation growth that will occur during the life of your gravel or crushed stone driveway. 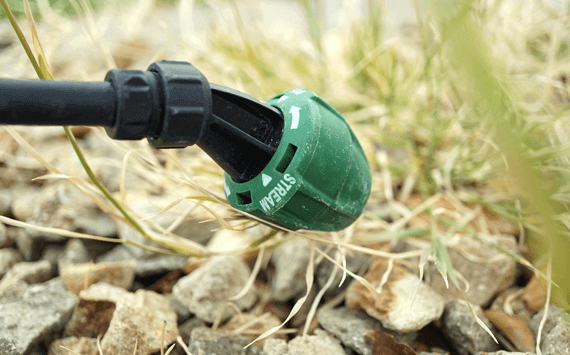 Keeping drainage planning in mind during the entire installation process will also help minimize ongoing maintenance. Keeping drainage ditches cleaned out and guiding the water runoff will also help extend the life of your gravel driveway. Is a Gravel or Crushed Stone Driveway Compliant with your HOA/Local Municipality? Be sure and check with your HOA (if you have one) or your local government municipality to make sure a gravel or crushed stone driveway is acceptable in the area you live. Most HOA’s or municipalities do not allow gravel or crushed stone driveways. Will A Gravel or Crushed Stone Driveway Look Good In The Neighborhood You Live In? Will a gravel or crushed stone driveway look good in front of your home? Maybe a different type of driveway will look better. Have you explored your options? Will A Gravel or Crushed Stone Driveway Stand Up To The Elements? How Much Maintenance Will A Gravel or Crushed Stone Driveway Require? If you want your driveway to last a lifetime, regular maintenance plays an important role in how long your gravel or crushed stone driveway will last. Is A Gravel or Crushed Stone Driveway Durable Enough For Your Needs? Is A Gravel or Crushed Stone Driveway Within The Budget? If the short term, up front cost is a deciding factor, gravel driveways are an excellent, low cost option. The long term trade off, however, is more ongoing maintenance costs. If up front costs are not as important and aesthetics are the most important as well as having a hard driving surface, then Asphalt Driveways, Concrete Driveways or Interlocking Paver Driveways are the alternatives. While initially the up front costs are higher, long term they require less maintenance costs especially you live in a snowy region. maintained properly or how it can look as it ages. As you can see, not maintaining a gravel driveway leads to weeds overgrowing the edges, blurring the clean cut look, and weeds creeping up into the gravel driveway making it look messy. You can also see an aging gravel driveway still doesn’t look bad, but the clean cut edges are gone. Gravel Driveways can be a beautiful, low cost addition to your home. The wide variety of different colors of gravel and crushed stone available can provide for an endless amount of designs and colors. See some different Colorful Design Ideas For Gravel & Crushed Stone Driveways. If you’re considering having a new gravel driveway installed, see our Gravel Driveway Installation FAQ’s section for more information. You can also learn more about the ongoing maintenance of gravel driveways by visiting our Gravel Driveway Maintenance FAQ’s section section for more information. Before you hire a contractor to install or perform maintenance on your gravel driveway, be sure and review our video and eBook series, “The Most Common Ways Gravel Contractors Rip Us Off And How To Avoid Them” ™ You’ll learn everything you need to know to hire a reputable gravel driveway contractor and get the job done right. Or save time and take the guesswork out of hiring a gravel driveways contractor to install or maintain your gravel driveway and pre-screened and background checked Gravel and Crsushed Stone Driveway Installation & Repair Contractors in your local area. Send 1 email and get up to 3 estimates from our pre-screened and background checked gravel and crushed stone driveway contractors! We would love to see it! Send us some pictures and we’ll add it to our website! Do you have snow in your area? If so, how do you clear snow off of the driveway without ruining the gravel? Yes. Here in Denver we get plenty of it! Unfortunately there is no way. You can do that but the gravel will eventually get pushed off of the concrete as you drive on it so it would be a temporary solution. Thank you so much for answering my question! What do you consider temporary? The traffic on the driveway is probably an average of 3 “round-trips” in small-mid cars each day. Can I just fill in the low spots instead of doing the entire driveway? Does one method last significantly longer? Thank you, again!! If you fill the low spots there are too many variables to predict with certainty how long it will last. Depends on weather, traffic and depth. Could last a month or could last through the winter. It’s hard to say. If you covered the entire driveway with road base rather than gravel it may last a little longer but it depends on the same things. Its really just a temporary solution. You are very welcome. Sorry couldn’t be of more help with a more long term fix. The obvious long term fix is to remove the concrete driveway and install a new gravel/road base driveway or pour new concrete or new asphalt depending on where you live. Good luck! Ironically I lived in Atlanta and still travel there occasionally! Denver is a great place to live for a 20 yo!